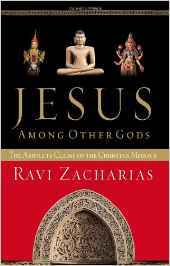 Jesus Among Other Gods by Ravi Zacharias (261.2 ZAC) This book is a brilliant defense of the uniqueness of the Christian message. With the eloquence of an apologist and the discipline of a scholar. Zacharias considers six questions that Jesus answered in a way that no one else claiming divine or prophetic status would have answered in the same manner. Some may resist Jesus’ answers, but when those answers are all added up, the skeptics will not be able to challenge His uniqueness.